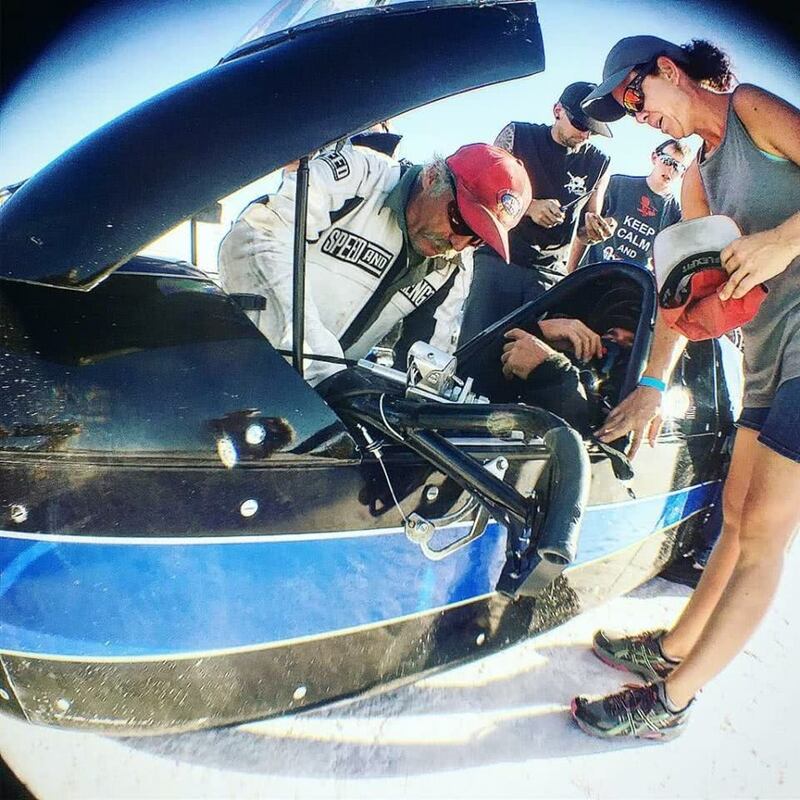 Hopes were optimistically high for land speed racers seeking a new world record at the Bonneville Salt Flats this year, as the salt was better than it had been in nearly a decade. The conditions were right for a change and the Guthrie-Levie Land Speed Racing Team set out with a goal of becoming the first sidecar motorcycle in history to break the 300mph barrier. At Speed Week in August, John Levie piloted their turbocharged Hyabusa-powered cycle (in one-day-old paint) to a personal best 305.705mph with a burnt up clutch, out the back of mile 4. However, the carnage included a chain, clutch, counter shaft, case & trans as Levie rocketed down the long course with his body just inches from the salt! The speed was exciting, but at Bonneville, no equal or greater back up pass means no record, which is why getting into the record books becomes the illustrious ‘white whale’ for all but a rugged few. Just a few short weeks later, a persistent Levie and team would return to World of Speed to finish what they started. Though their second attempt was not without incident, Guthrie-Levie Racing set a NEW world record in their MS3Pro ULTIMATE controlled streamliner and joined one of the most exclusive fraternities on the planet! John Levie joins the 300mph Club as one of only three single engine motorcycle pilots in the world! Levie’s speed at exit of the final mile was a blistering 320.304mph, a mile that only lasted 11.4 seconds! Now, there is absolutely nothing like it! Imagine for a moment, that you’re behind the wheel of the push truck, in the AC, as your pilot sits in a sticky sponge of a fire suit in line at the great white dyno. The radio is set to the timing tower’s broadcast frequency. The butterflies, even for you, are overwhelming and you’re not even in the cockpit! Your team has thrashed for 12 hour days, nearly 7 days a week for the last month. Your number is announced. The announcer says your class record is 260mph. THIS… is what you’ve worked for! THIS… is exactly what it looks like! stock head, cams, crank & off-the-shelf JE pistons with Carrillo rods & a beefier transmission. Turbo is a Garrett T4 with custom inter cooler (Bell core) to custom plenum with a 92mm LS style throttle body. There is NO suspension and the custom rigid chassis/ cage is made from 1 5/8″ .120 wall DOM. MS3Pro ULTIMATE controls everything including per cylinder EGT correction via CAN EGT. The combo is tuned by MegaSquirt Addicts support page founder, Jesse Brown. The Guthrie-Levie Racing Team plans to raise the bar in excess of 350mph next year! Connect with us and stay on top of the latest product news and success stories! Follow us on Facebook, Instagram and subscribe to our newsletter at the bottom of any DIYAutoTune.com web page!